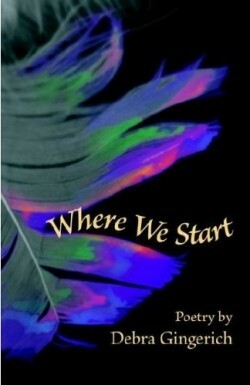 Debra Gingerich’s first book of poetry, Where We Start, was published by Cascadia Publishing House in March 2007. Through contemplative lyrics, historical narratives and edgy prose poems, this collection of poetry probes the intersections of self and other, private and public, and the individual and community. The title, Where We Start, is a fitting description for the many ways that these poems explore the beginnings of and in a life, including cultural identity, childhood experiences, and a new marriage. Gingerich’s poetry has been strongly influenced by her experiences as a part of a Mennonite community and explores the tensions between individual identity and community loyalty. This tension has been expanded as she also creatively investigates her husband’s unique and difficult Eastern European upbringing, born and raised in the former Yugoslavia where community loyalty turned into war. These poems stay true to their complex questioning. With a sense of paradox and wit, a willingness to explore the poem’s surprising turns and defer comfort, Gingerich builds an impressive collection of poetry that is urgent and compelling to any reader willing to explore the dark corners and sharp turns of any life’s migration. Order Where We Start from Amazon.com, BarnesAndNoble.com or your favorite bookstore. “These poems, windows onto worlds-within-this-world, stubbornly eschew the sentimental, buggy-riding, creamed corn version of ‘Mennonite.’ They serve up, instead, a complex, glinting, hard-edged testimony of faith, love, and history that ranges from barnyard to Balkans, tracing everything from recipes to bomb casings, a brave braille of the human heart that persists, that prevails. It’s a singular and courageous book.